MHT CET 2019 Admit Card Download – Maharashtra State Common Entrance Test Admit card available to download on its official website mhtcet2019.mahaonline.gov.in. The Government of Maharashtra, State Common Entrance Test released notification and invited online applications for the Maharashtra State Common Entrance Test. A huge number of candidates applied for the exam. Aspirants who had applied can get the MHT CET admit card 2019 from the direct link provided below or from the official website from today. Without admit card candidate is not allowed to write the examination. The examination is scheduled on 2nd may to 13th May 2019. MH CET 2019 hall ticket contains details regarding exam venue, roll number etc. Government of Maharashtra, State Common Entrance Test Cell shall conduct “Common Entrance Test” MHT-CET 2019 for admission to First Year of Full Time Degree Courses of Technical Education (Engineering and Technology, Pharmacy and Pharm. D. for the academic year 2017-2018. Candidates who had applied for the entrance examination in prescribed time can get the hall tickets from the official website. The Government of Maharashtra, State Common Entrance Test is going to conduct Maharashtra Common Entrance Test (MH CET) from 2nd may to 13th May 2019. A huge number of candidates who are looking for admissions into Health and Science Courses, Engineering and Pharmacy courses in the Maharashtra state government and private colleges applied for the examination. Candidates who had applied can download MHT CET 2019 admit card from the direct link provided below. MHT CET 2019 admit card will remain available up to the exam date i.e. May 2, however, the students are advised to download the same as quickly as possible so as to avoid the last minute hitches. The admit card can be accessed from the Candidate login page available at official website mahaonline.gov.in. The MHT CET 2019 will consist of three papers. Each paper is of 100 marks and is of Multiple Choice Questions. For downloading Admit Card, Candidate should visit the website “mhtcet2019.mahaonline.gov.in”as per the schedule. Issue of Admit Card is merely an enabling document for appearing at the MHT-CET 2019 and does not imply that the candidate satisfies all the requirements of eligibility conditions of admission. Candidates can Download MHT CET 2019 hall Ticket Through Candidate login with registration Details in above mentioned link. 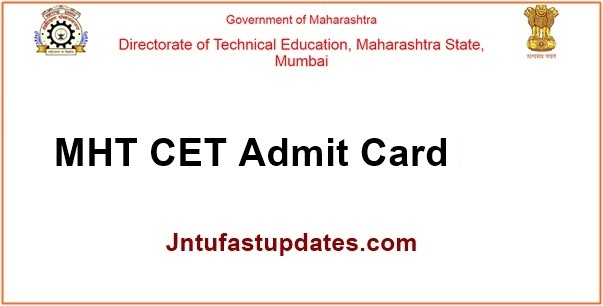 Click on MHT CET Admit Card 2019. The Competent Authority will conduct the examination, evaluate the answer sheets and declare the result. The result will be declared on websites http://www.dtemaharashtra.gov.in/mhtcet2018 as per the schedule. The Competent Authority shall invite application for admission and after verification of documents and eligibility, publish the Merit Lists as per the Rules. The downloadable mark sheet will be made available on website “http://www.dtemaharashtra.gov.in/mhtcet2018” as per schedule.